Pecan pie is, by far our family’s favorite. 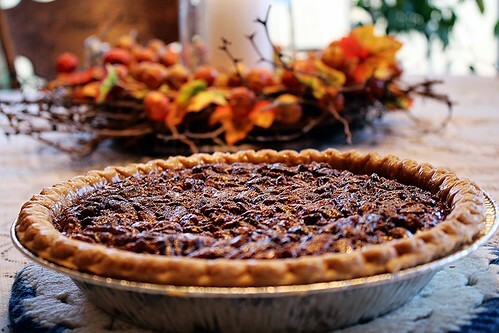 I cook a pecan pie every Thanksgiving and Christmas. In a large bowl, stir eggs, corn syrup, sugar, butter and vanilla until well blended. Stir in pecans. Pour into pastry shell. Bake in 350F degree oven for 50-55 minutes or until knife inserted halfway between center and edge comes out clean. Cool. Posted on December 12, 2013 by cookingwithpizazzPosted in Dessert, Freezable, Holiday, Make Ahead, PieTagged Food, Freezable, Holiday, Pie, Recipe.